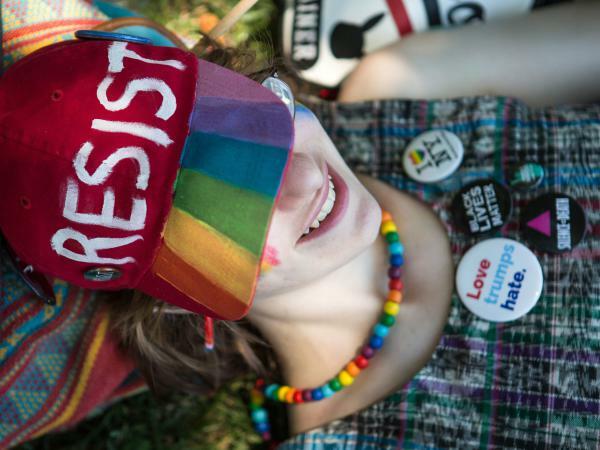 Sarah Corwin of Brooklyn, N.Y., relaxed in the shade on the National Mall during the Equality March in Washington D.C. on Sunday, June 11. 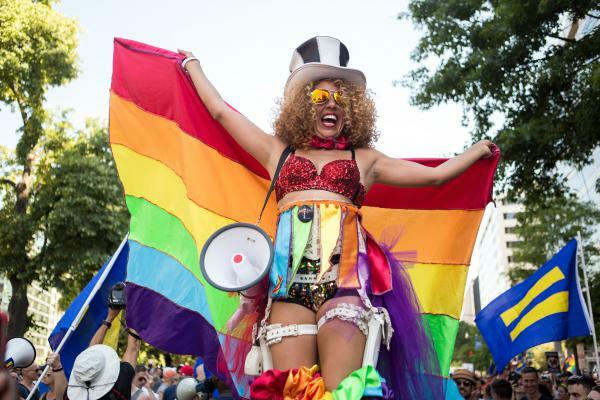 Regina Armenta of Philadelphia, Pa., cheered from above the crowd atop a pair of stilts during the Equality March in Washington, D.C., on Sunday, June 11. 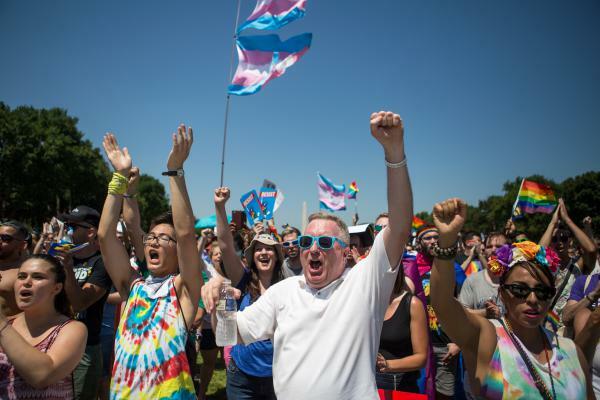 Michael J. Cooper, center, of Arlington, Va., cheers alongside a vast crowd of other demonstrators on the National Mall in Washington, D.C., during the Equality March on Sunday, June 11. Thousands of demonstrators walk together on Constitution Ave. NE toward the United States Capitol building in Washington, D.C., as a part of the Equality March on Sunday, June 11. An abundance of rainbow fashion could be seen during the Equality March in Washington, D.C., on Sunday, June 11. 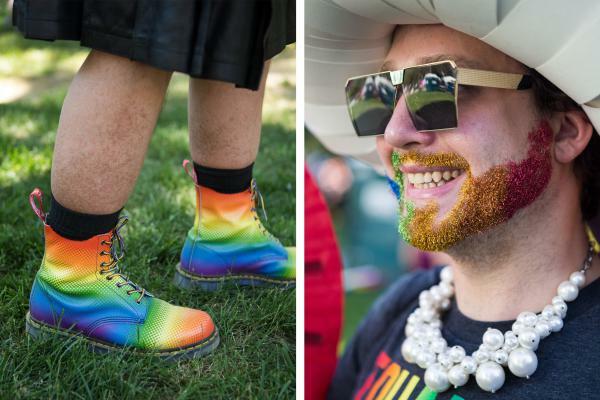 28-year-old Tyler Cargill, right, showed off a glittering beard, while 50-year-old Charles Heath, left, sported a vibrant pair of boots. "We don't believe in the President, but we believe in the country; that's why we're here," Heath expressed. 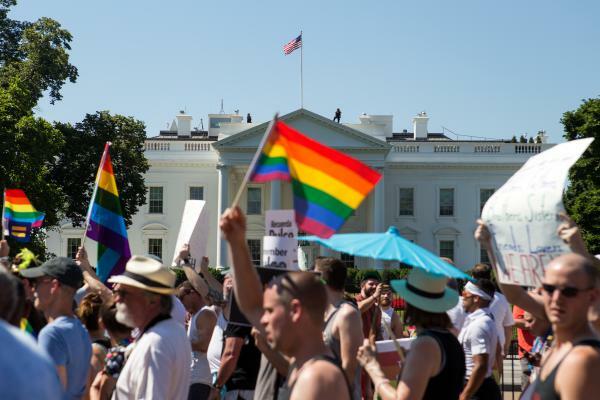 Thousands of demonstrators cross in front of The White House during the Equality March on Sunday, June 11. Mike Curtis, left, and Theo Smith of West Palm Beach, Florida, share a kiss just moments after becoming engaged to get married during the Equality March in Washington, D.C., on Sunday, June 11. 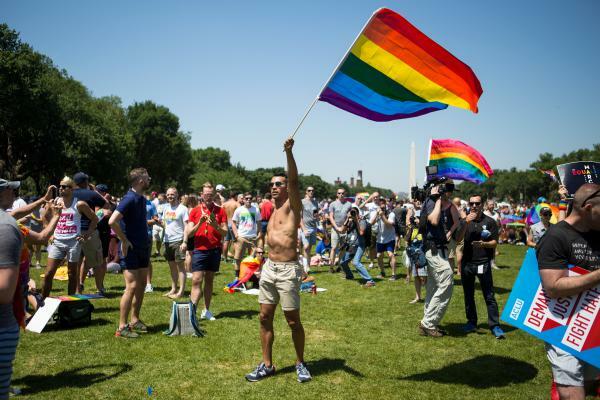 Pride flag in hand, Miguel Perez of Las Vegas danced on the National Mall during the Equality March in Washington, D.C., on Sunday, June 11. Demonstrators at the front of the crowd lead thousands of others down 17th St. NW during the Equality March in Washington, D.C., on Sunday, June 11. Sh'mon Jackson, a drag queen from New York. Nemat Sadat, originally from Afghanistan, now lives in Washington, D.C.
Estrellia Sanchez, a transgender woman from Atlanta. Reg Franchi, a transgender gay man from Los Angeles, Calif.
Dustin Moore, 31, marched in D.C. to express his discontent with the current administration. Crowds stretched for blocks across the parade route near the National Mall, and while Lewis said they anticipated more than 200,000 marchers, she said the number of people who showed up blew their expectations. 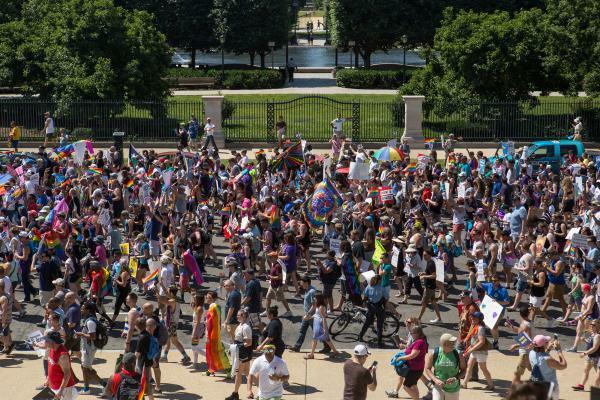 Lesbian, gay, bisexual, transgender, queer, straight, white, black, Latinx Americans and people from across the world all marched in solidarity Sunday to protest how they believe the Trump administration could negatively affect the LGBT community. Participants were all ages. And they came from all over the world, on two feet or more. One group of softball-playing best friends from Tampa, Fla., arrived with lettered signs that spelled out RESISTANCE. They all wore top hats as a tribute to their friend, Top Hat Eddie, who was killed one year ago in the Pulse shooting that rocked the LGBT community. They said part of the reason they came out was in remembrance of their friend and to make sure nothing like that happens again. That starts, they say, with resisting the Trump administration. "It's very important to express the importance of how far we've come," said 46-year-old Anthony Micheletti from Chicago. "I will not allow them to take [my rights] away. You'll have to drag me in heels." 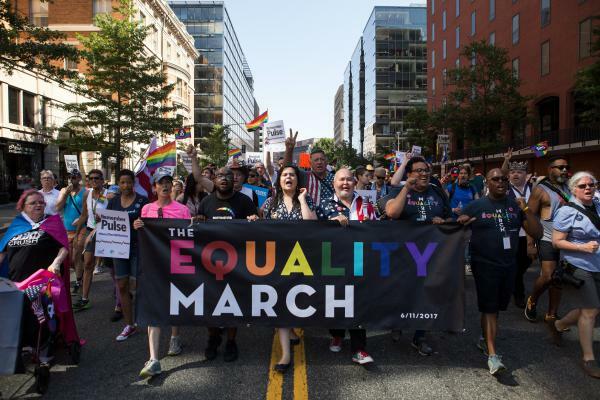 The political march for equality comes one day after the Pride Parade in D.C., while marches and protests are ongoing around the country this June for Pride month. And many participants feel as if this time in history is a turning point for the LGBT movement. They see it as an opportunity to note that while LGBT rights increased over the past decade, there's still a long way to go. "The parade yesterday was fun, but today we're fighting for our rights," Sh'mon Jackson said. She's a drag queen from New York who traveled to the nation's capital for this weekend's festivities. "You have whatever you want," she said of the politicization of pride. If you want to get political, you can come to this march, she said. If not, "across the block there's a party. You can make [Pride] what you want." Nemat Sadat wandered around the Mall after the Equality March with a sign proclaiming his identities: immigrant, gay, creator. "Since Stonewall, this is a continuation and expansion," he said. "Today, we're here to fight against the Trump administration." In particular, Sadat said, they were there to advocate against how the Trump administration has accepted human rights violations against the LGBT community across the world, like in his home country of Afghanistan. Estrellia Sanchez, a transgender woman from Atlanta who was born and raised in Mexico, said she attended the march to fight on multiple fronts — through her passions for immigration reform, prison reform and transgender rights. "I want equity for my community who are incarcerated," she said. "I am human." Sanchez is one of many who traveled far for this march. "We came here to show that all corners of the country are united," said John Dyrcz, a 32-year-old man who traveled to D.C. from New Mexico with friends Chris Heise, Jason Anderson and Jesus Gallegos. They all identify as gay men. Dyrcz said they're glad the politicization of the movement is becoming stronger again. "To make [the movement] political, makes it visible." 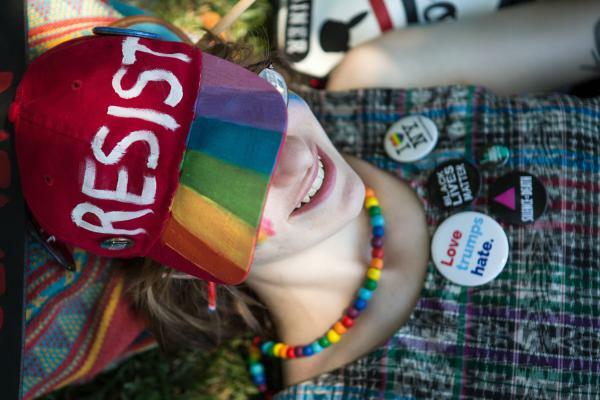 Reg Franchi, a transgender gay man, traveled from Los Angeles, which is having a resist march in place of its annual Pride Parade this year, where they've traded the typical pride floats for a march on civil rights for LGBT people. Franchi echoed the feelings of the rest of the marchers in D.C. and back home. He said he's ready for pride to get back to being political. "The very first march was in memory of Stonewall," he said. "So it's going back to our roots." Dustin Moore is a 31-year-old gay man who says he understands why the movement has always been so political, but that LGBT people never actually asked for its politicization. Many members of the LGBT community, Moore included, feel that their identity has been co-opted into a political movement without their consent. "It's not our decision to politicize it," he said. "Treating it like it's not a political arena does us no good." The entire month of June has historically been dedicated as Pride Month, with celebrations all month across the country. For the first time in years, the U.S. president did not acknowledge the month publicly, and the lack of action by President Trump did not go unnoticed by the LGBT community and their allies. Despite that, Pride Month will continue with events around the world for people to stand in solidarity with the LGBT community. Nemat Sadat said he's looking forward to all the progress that's left to be made. "We have to be the beacons of hope and light in this world," he said. 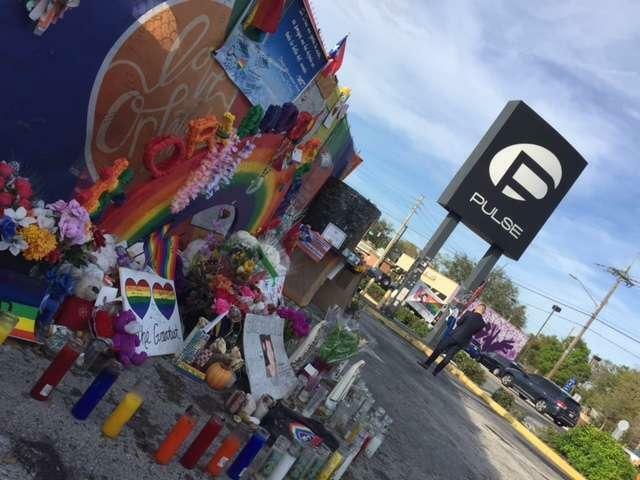 Thousands are expected Monday at events throughout downtown Orlando to mark one year since the Pulse mass shooting. 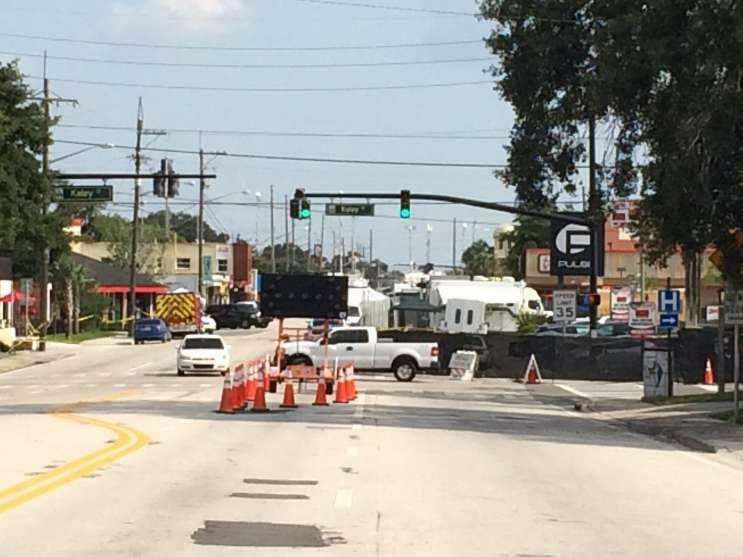 More than 750 journalists are credentialed to cover the events at the gay nightclub and Lake Eola, where a large vigil is scheduled at 7 p.m.
Ceremonies will take place throughout the day at Pulse. Some survivors, family members, first responders and medical providers will be returning for the first time since the attack.